The ball is rolling in a process ultimately aimed at protecting and enhancing a 137-acre parcel of green space in Charlottetown’s north end. 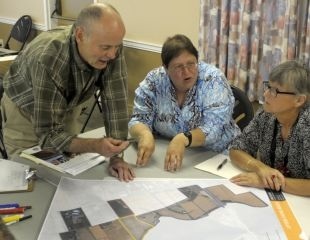 About 70 individuals, including those from the Upton Farm Land Trust, Ekistics Plannig and Design, and members of the public, met last night for an input session on the farm land at West Royalty Community Centre. The Upton Farm Trust has been working towards getting the area recognized with the Natural Areas Protection Act (NAPA), which requires a master plan. Jacob Ritchie, an urban planner with Ekistics, said the input session was in some ways starting from scratch towards a master plan. However, he also said previous input collected through an online survey, which saw more than 100 individuals complete, and discussions on the site would also be included while drafting the plan. “The opportunity exists here to create a park,” he said. “But people have already thought about this. When I say start from scratch, I mean in a hundred years this ten year process they’ve been working on will seem like a single point in time. The meeting saw members split into groups of about eight. Ritchie said individuals should think about what they want the land to look like in 100 years, as well as specific details to be included in the master plan. Many of the suggestions followed similar themes of planting trees to restore the Acadian forest, an off-leash area for dogs and enhancing and linking current trails. Kirsten Connor, chairperson of the Upton Farm Trust, said she saw the meeting as going well and that many are like-minded in what they want for the future of the area. She said one major issue that has to be addressed is a better parking area for individuals going to the farmland. Ritchie also went through a list of NAPA restrictions, which largely restricts any type of infrastucture on the site. Ritchie said Ekistics would be taking the suggestions from Thursday’s meeting into the next stage of drafting a plan. This entry was posted on August 2, 2013 at 6:52 pm and is filed under Uncategorized. You can follow any responses to this entry through the RSS 2.0 feed. You can leave a response, or trackback from your own site.